Think of marrow as grown up Zucchini. Native to England, marrows are bland green, oval summer squash that can grow to the size of a watermelon. Zucchini and courgette are the same thing – zucchini Italian name and courgette French. Both mean baby marrow. 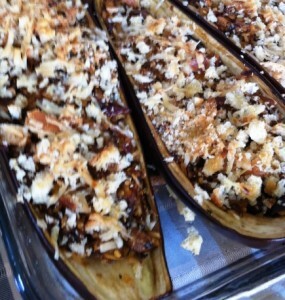 You can also use egg plant for this dish. This dish was served in 1st class on the Titanic. Halve marrow lengthwise; scoop out flesh with spoon leaving ¼-inch shell. Discard large seeds. Chop scooped flesh into small dice; reserve. In skillet, heat oil over medium heat; add onion and garlic and cook, stirring often, for 7 to 8 minutes or until softened and lightly browned. Stir in basil, oregano, reserved marrow, and tomato paste. Cook, stirring often, for 5 minutes. Increase heat to high and add mushrooms. Cook, stirring, for 3 minutes or until vegetables are well browned; stir in vinegar. Stir in rice, salt, pepper, and 3 tbsp. of the cheese. Spoon into hollowed vegetables, packing lightly with back of spoon. Sprinkle evenly with bread crumbs and remaining cheese; drizzle with butter. 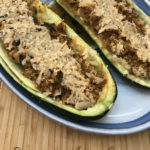 Place in greased baking dish in 350°F/180°C, Gas Mark 4 oven for 30 to 40 minutes or until marrow is fork tender and topping is well browned. To serve, slice marrow diagonally in 3-inch slices. Garnish with fresh basil. Eggplant also works well as your marrow.